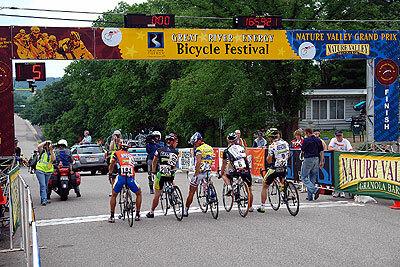 I worked on the 2007 Great River Energy Bicycle Festival/Nature Valley Grand Prix races last week. With a bit of effort they might be able to come up with a longer name! Here's how it went. (Note: I actually am posting this July 16th, having just had a frantic couple of weeks with an aunt from England visiting, but I'm leaving the post date as the date I wrote most of this)(It may seem cheesy post-dating, but on the other hand all the camera crews filming this race do so for a program that won't air until August on the Poetry Channel (Verses)). It started Wednesday. My cycling buddy Paul rode up from Cedar Rapids, Iowa to work the races on his Stealth Bike (a black Nashbar cyclocross frame outfitted with virtually all black components). I figured he'd call or something when he got to downtown, but he didn't, so I went down in my truck at about 5:00 to do course-marshalling. Paul was already there, having arrived at about 1:00 and spent the afternoon setting up including doing the giant inflatable Wheaties box. I checked in at the volunteer tent, was issued the standard orange vest, flag and whistle and sent to the northeast corner of Mears Park to be a course marshall. This is the fancy name for crossing guard and the main task is to keep onlookers from going onto the course in front of oncoming cyclists. The main challenge here can be on big open corners with lots of drunks, but this night the corner was just medium-sized (and we narrowed it down for the men's race for better crowd control) and the crowd was well-behaved. This was my corner in Saint Paul. While standing here I saw a guy walk by with the best t-shirt of the entire five-day affair. On the back it said "The Older I Get, The Faster I Was". Paul took this photo. 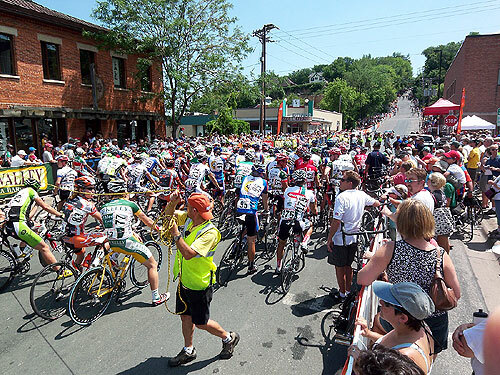 The only thing notable about it is that I'm in it, corner marshalling on the left in the yellow shirt, olive shorts and white baseball hat. I shared the corner with Nora. Clouds threatened all evening, but it didn't rain until the teardown was nearly complete. It did rain and storm quite a lot elsewhere around East-central Minnesota this evening. 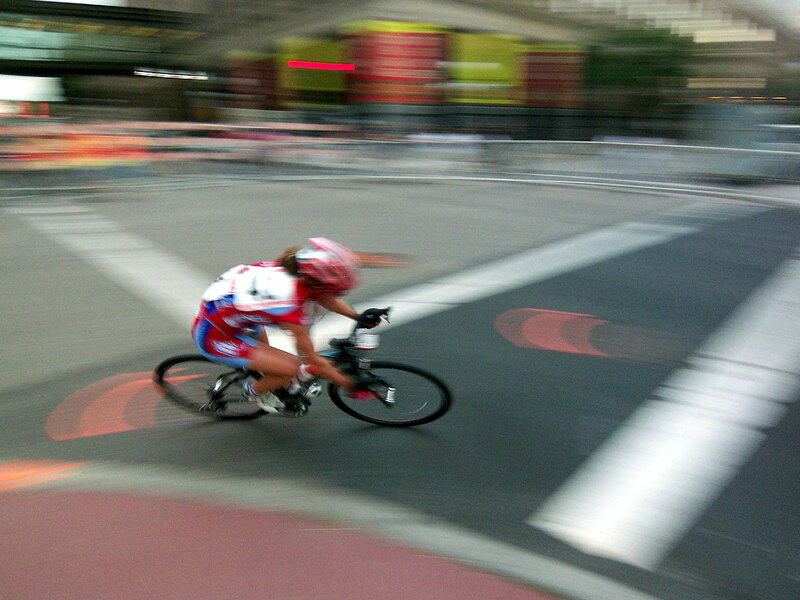 One of the women zooms past. I figured we might get wet this evening as huge impressive clouds built up and moved around us, but all night long the weather held and the storms went elsewhere (tonight and Thursday the insurance company for which I work would get several hundred hail damage claims from north, south, east and west of Saint Paul) until well after the races were over. Once the men's race was done, I traded in the orange vest for a yellow one and worked on teardown duty which seemed to go pretty well. 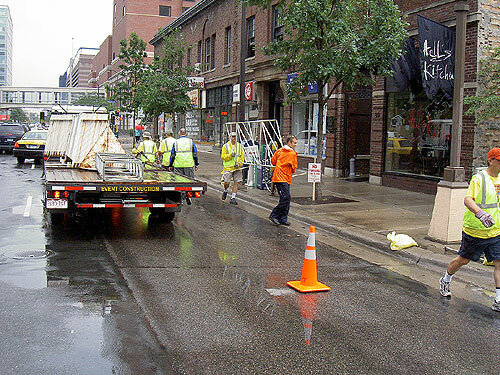 At about 10:00 we got done just as a thunderstorm finally hit downtown Saint Paul but it mostly just rained on us as we walked to the parking ramp to get the truck and go home. This criterium was new to the Nature Valley Grand Prix. 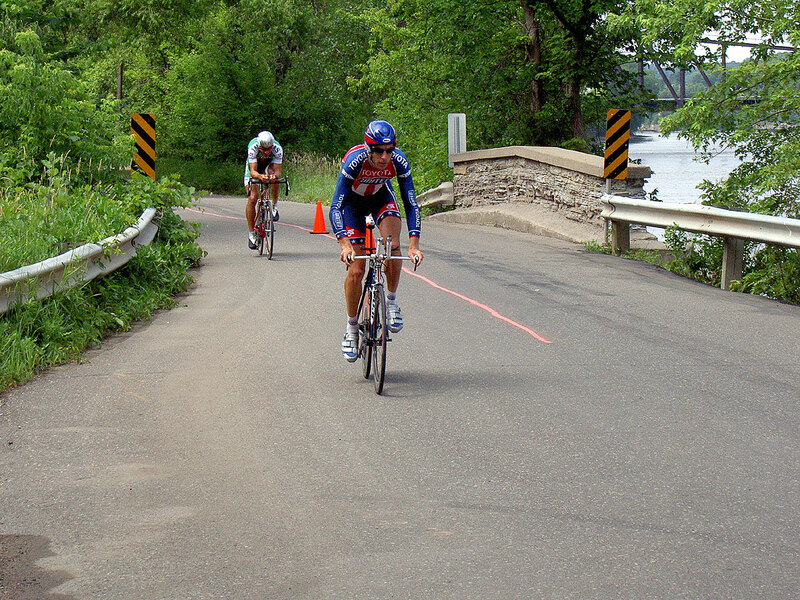 The last couple of years when I've worked multiple days on the event, the Wednesday Saint Paul race was a time trial along Shepherd Road. 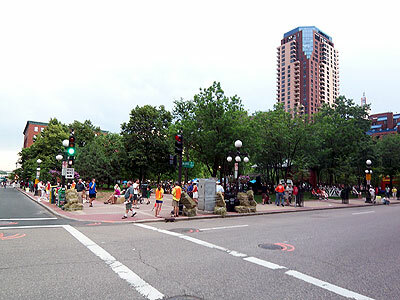 While pretty user-friendly for a time-trial (there is a parallel bike path along the whole thing), the race ran mid-day down the hill from downtown Saint Paul and attracted only very modest crowds. Time trials can be a bit dull, too, from an observer's point of view. 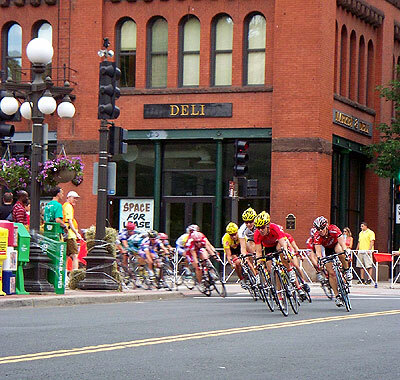 The criterium format in the evening is much more of a crowd-pleaser, with the racers going round and round a course including Mears Park right in the core of downtown Saint Paul. This seemed to go very well. Thursday Paul and I didn't work any races. 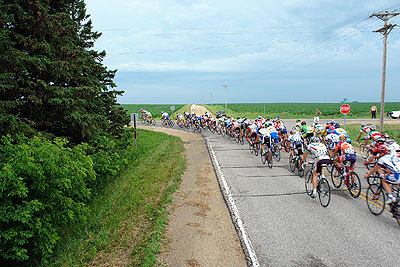 We instead went to Cannon Falls to watch the road race. Cannon Falls is about 50 miles south of Saint Paul, so we just drove down. We went downtown and wathced the start of the men's race, then drove out into the country to catch them at a couple of spots. Last year we went to the transition from pavement to a couple of miles of gravel but this year the course was altered somewhat due to some highway construction on Highway 1. 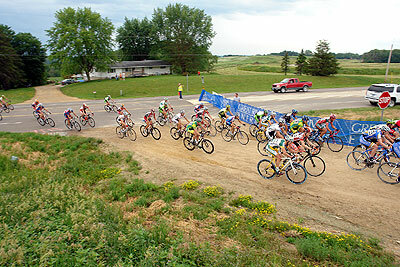 The race leaders are presented at the start line in Cannon Falls. Paul has actually met this guy. A couple of years ago Paul did a tour of the Tour of Georgia. They'd ride the course, travel in a bus with some racers, meet some afterwards. This guy was one of the racers on the bus. 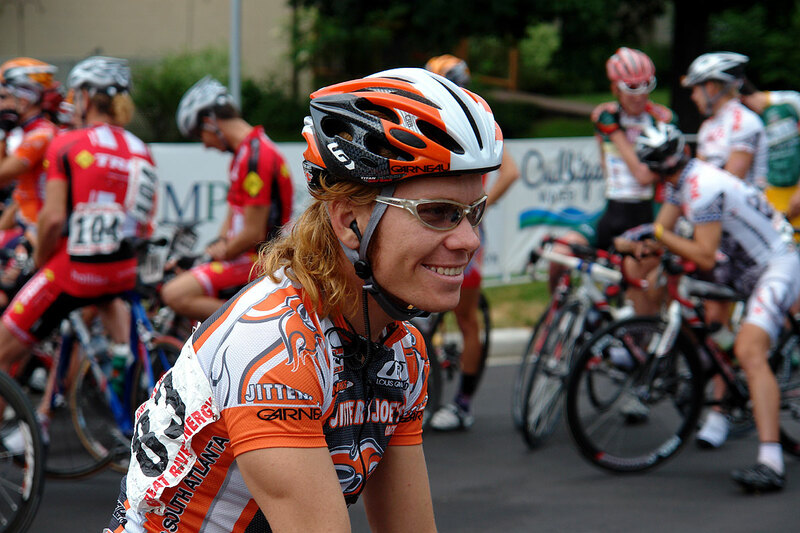 He had perhaps the best hair in the race. Once again, weather threatened. 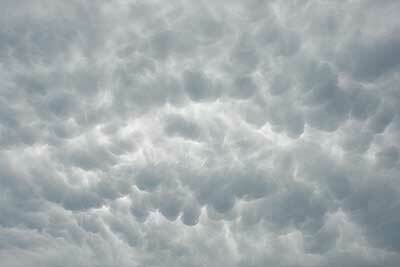 There were dark clouds and even cumulus mammulus overhead but it never did rain. 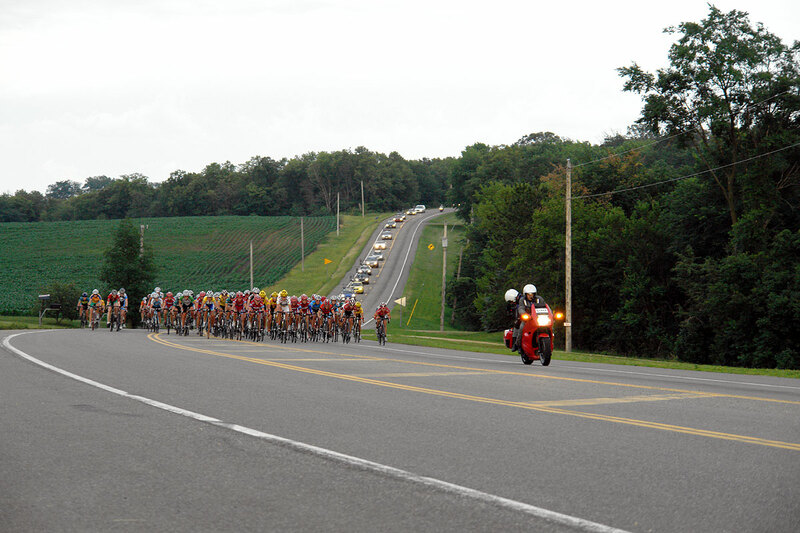 In fact, compared to last year's heat and brutal wind out of the south, the occasional breath of wind and cool overcast skies made for a delightful evening to ride 60 miles in 2 hours and 21 minutes, which is what the men did. The lead police car ahead of the racers. 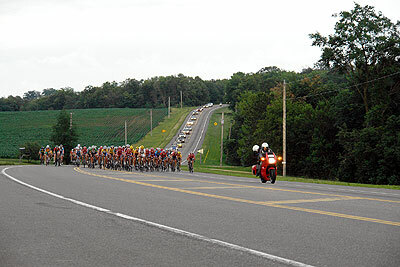 The peloton heads through the corner. Hey! 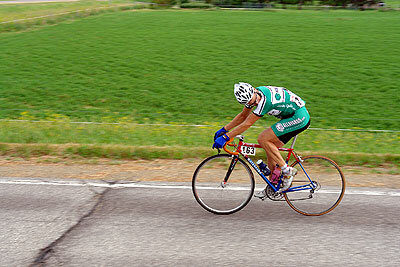 A guy racing on a steel-framed bike! Of course, he is well-behind the peloton, looking hopefully back. We caught them at a couple of places and waited for the women to come along as well. There were dark hints of gravel again this year, and word out that a couple of women had crashed in the practice ride and that the women anyway had agreed to take it easy on the gravel, but nobody seemed to know where it was. I had my trusty DeLorme map with the course highlighted (as well as last year's, so I could compare and contrast) and once the women had gone by, Paul and I headed back to town. The men weren't due for a bit, so I idly drove through town and out onto a county road and, Bingo!, the gravel! 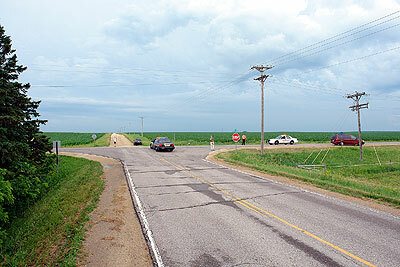 It was just a short stretch, right before coming into Cannon Falls, and on a road that's normally closed off. Dramatic clouds, often associated with violent weather, above the course. There was just one guy there, and when the race came he was going to have to pull fencing across the road, stop traffic and direct racers. This seemed like a lot to do for one guy, so Paul and I donned our vests and helped him. The men's peloton approaches the gravel. The men transition to the gravel. This would be pretty short; last year it was a couple of miles. The men came by and made the transition without incident. We reopened the road and stood around talking with this gentleman, a retired malted barely salesman. Apparently there was a big barley malting operation in Cannon Falls at one time and Goodhue County had been a big producer of barley for malting and thence beermaking. Budweiser one day dropped their business and the operation never really recovered, and eventually shut down. We chatted about a bankrupt development across the street, landscaped, roads, lights and sewers, but lots of problems with the soil which is full of blue clay and causes heaves in the roads and disrupts foundations, I guess. About 50 minutes after the men came through the lead vehicles came into view and we again dragged out the fencing, stopped traffic and pointed down the road. The women made the gingerly transition to gravel and disappeared over the hill. The support cars and motorcycles all came through, a couple of stragglers, and we reopened the road. The volunteer guy's car wouldn't start, a dead battery, and we didn't have jumper cables, and his OnStar wouldn't work in the car because of the low battery, and his OnStar number was busy from his cellphone, so we promised to stop back after dinner to make sure he was ok, and went into town. The Mill Street Cafe or something like that is where we ate, good beer and mediocre food (at least the bourbon marinade salmon sounded much better than the overcooked fish we got), and then popped back out to see if the volunteer guy was ok. He was gone, as was the fencing. Just out of curiosity, I drove up the gravel road to see where it came out, but the chain that closes it off was already back across the road and I had to go out the way I came in. We headed on home. Friday started off with the Time Trial. 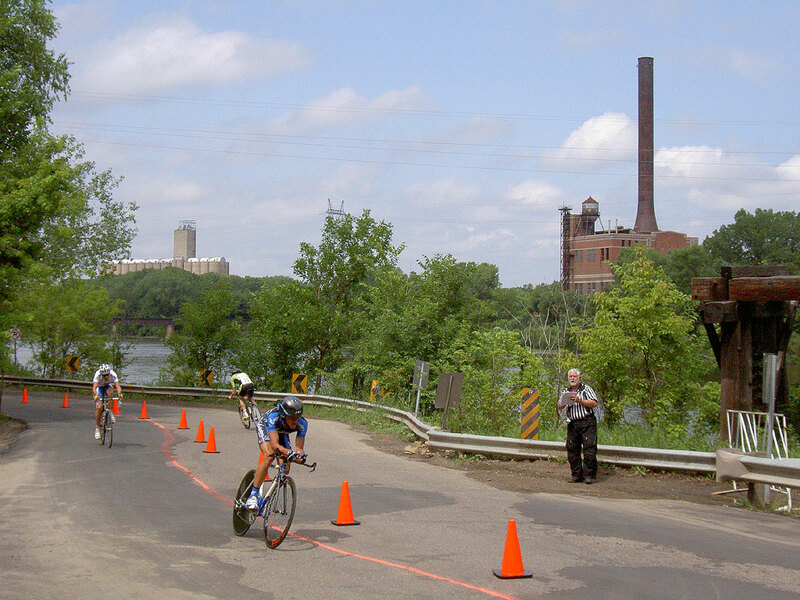 This was run in Saint Paul, but instead of sending them down main artery Shepherd Road (there was at least one complaining letter to the editor about this last year), it was on the south side of the river starting under the High Bridge and running along Lilydale Road to the Saint Paul Yacht and Pool club. This is a very un-busy road and its main defect as an event venue was that there isn't a continuous bike path alongside so that you can ride down to the end from the start line. At one point the road jogs under what used to be a railway bridge (the short bridge is gone, but the approach trestle is still there), then down a hundred yards and across a small bridge. 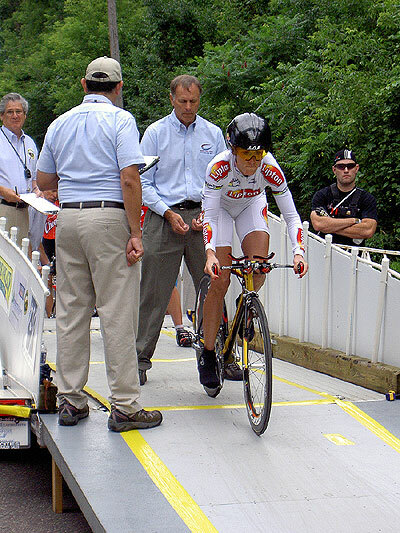 There is a bike path up to the trestle crossing and then after the small bridge, but that's a hazardous gap in between with the racers coming out every 30 seconds and no clear view through this jog. The women were already racing when Paul and I showed up on our bicycles about 9:00. When this had been the first event, the order was pre-established. Now that the Saint Paul criterium and Cannon Falls road race were under their belts, there was a General Classification order and the judge was having trouble making herself heard. I asked if she wanted help getting racers up to the start and she said no. A few minutes later number 11 barely made it, rushing past the line, up to the start, and stabilizing for maybe 10 seconds before being launched off on her run. Kristin Armstrong starts her time trial. She'd be back 10 minutes 24.36 seconds later, well ahead of the others. She would also win the whole Grand Prix by the end of Sunday. With not much to do, Paul and I watched the women go. We drank some free coffee and laughed at ourselves: You know, without dedicated volunteers like our noble selves, who would make these events possible by standing around drinking free coffee? We wandered down to the trestle. We stayed here quite a while as the men went by. There is a bit of abandoned roadway that bears left and it turned out to be a handy place to pee and also it led past some trash to a path down to near the stone bridge. I took some photos there, then helped a bunch of the women racers in getting across the road and down the course to where the bike path resumes. Riders going both ways. The abandoned railway trestle ends on the right, a judge guy with a radio checks off riders in the middle, and two inbound riders come through the swerve as an outbound rider heads west. That's an abandoned generating plant across the Mississippi, in the background, and an active grain elevator. Two riders inbound over the narrow bridge. Three riders coming through the road bend. I'm not sure who's the hunter and who's the prey here, but someone's having a bad time. After a while I went back to the trestle. One of the motorcycle guys pulled off and parked. He said one rider had a deer run across the road just in front of him. He couldn't tell from behind quite how close it had been but it looked close, he said. A judge was across the road checking off riders on a list. He had a radio and would let us know how far along we were. The last five men went at one minute intervals. 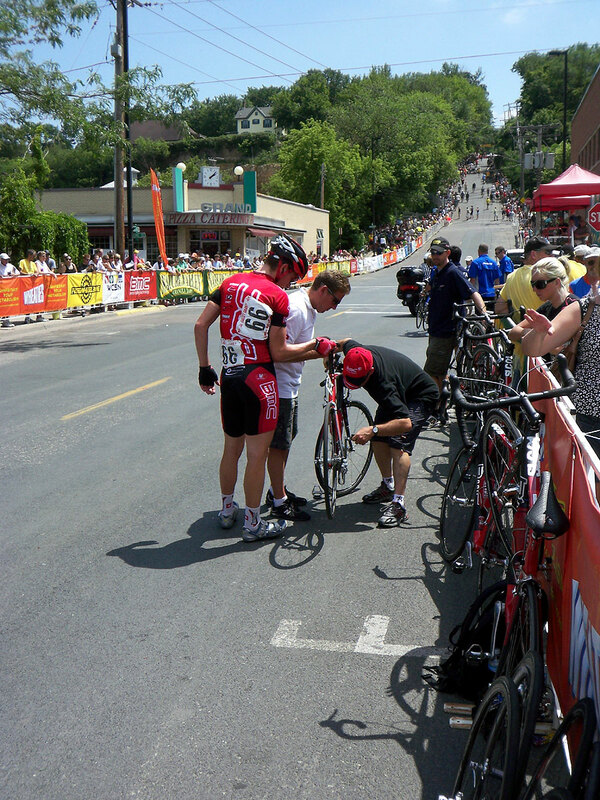 Once the last of them came by we rode back to the start/finish line, parked the bikes, and worked on teardown. This went quickly; there was only a bit of white fencing up. About 12:30 or so Paul and I rode off and headed home. I rode Paul past a bunch of the landmarks for my usual cycling rounds; the entrance to the Intercampus Transitway, the Raymond Street turnoff, past Muffaletta where I took girls other than my wife on dates as far back as 1984, down Como, over the Talmadge St. level crossing the railway wants to dump, over the Stone Arch Bridge and through downtown Minneapolis. We got to the Volunteer Tent erected on Nicollet Mall just outside the Dakota, locked our bikes up to one of the tent poles, put on the reflective vests, ate a sandwich and then looked around for the fencing truck. One of the coordinator guys came up. You guys looking for something to do? Yep, I said, we're looking for the fencing truck. You wanna do sandbags? Sandbags? Nope! This is the third year I've taken time off from work to work these races, and a couple of years before that I just course-marshalled the Friday night Minneapolis Criteriums (Criteria? ), and I have figured out what I like to do and what I don't. I'm happy as a clam with the fencing truck, whether pulling fencing off and setting it up, or taking it back down. It's a lot of work, as with many simple tasks there are a couple of tricks to it, but when you get the experienced volunteer group, it all happens in an unspoken coordinated fashion from which I derive some satisfaction. I don't mind taking down the start/finish structure, I don't mind cutting the zip ties to remove the sponsor banners, I did CAUTION taping for the first time this year and that was OK, and course marshalling is fun. However, there are some things I don't like. Sandbags is one of them, I'm 6'5" tall and have a sometimes-wonky back, the last thing I need is to be bending over and lifting damn sandbags all over the place. The same goes for banners; I'll happily snip them off the fencing and even brought along two pairs of wire cutters to do it with, these things being at a real premium at teardown time, but you need to find someone shorter and younger to roll the damn things up. I'm not fond of collecting the haybales, either. There's nothing wrong with these jobs, mind you, I just don't like 'em. Sandbags? Not just No but Hell No! Where's the fencing truck? I found it. 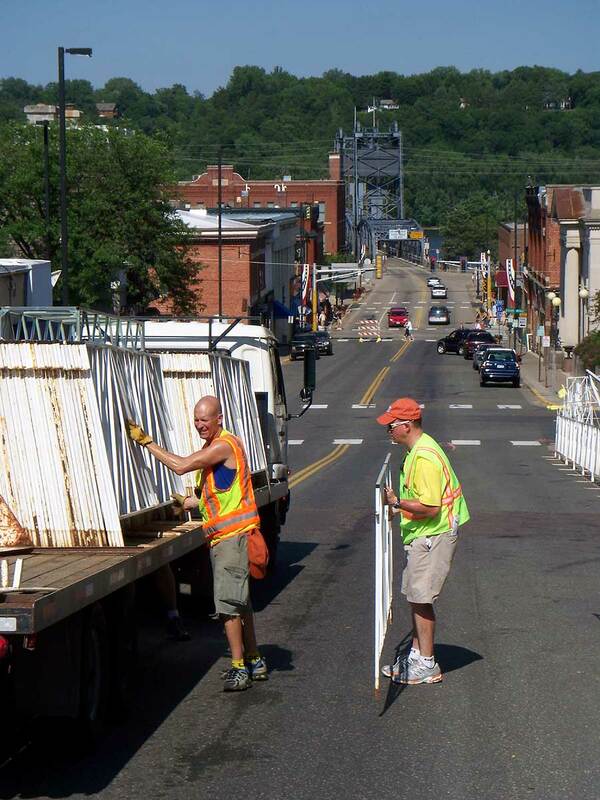 We don't get to close off the streets until 6:00PM but a lot of the white fencing can be set up alongside the streets and pulled into place when the time comes. During this period it rained. It always rains on the Minneapolis Criterium Friday. I put on my comical Ortlieb Waterproof Hat and my raincoat and we set up fencing in the rain. Last year there was lightning and hail and it rained later and delayed or shortened the races. That storm during teardown was of epic proportions and I have never been so wet without actually going swimming. This year the rain all fell during setup. I went to get the raingear and found the Volunteer Tent was draining about a quarter of its rainfall collection onto our bicycles, including Paul's 1973 and my week-old Brooks saddles. I put a garbage bag over them. Can't possibly let a Brooks get wet, you know, might shrink or dissolve or something, so They say. We got all the fencing out in place and Paul and I mooched a Buy One Get One Free Caribou coupon out of a volunteer swag bag and went to Caribou and had a cup of coffee. Did it rain? Is the pope Catholic? 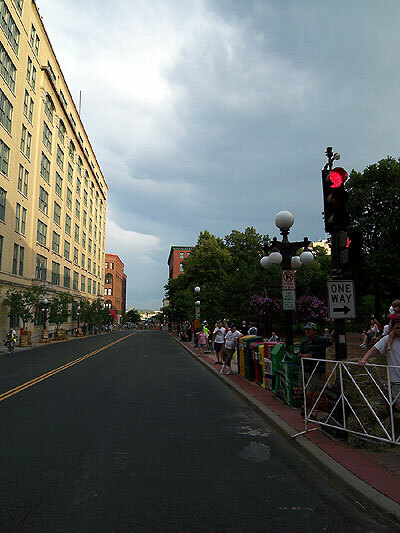 This is the Minneapolis criterium, of course it rained! Not during the race, though, just during setup. 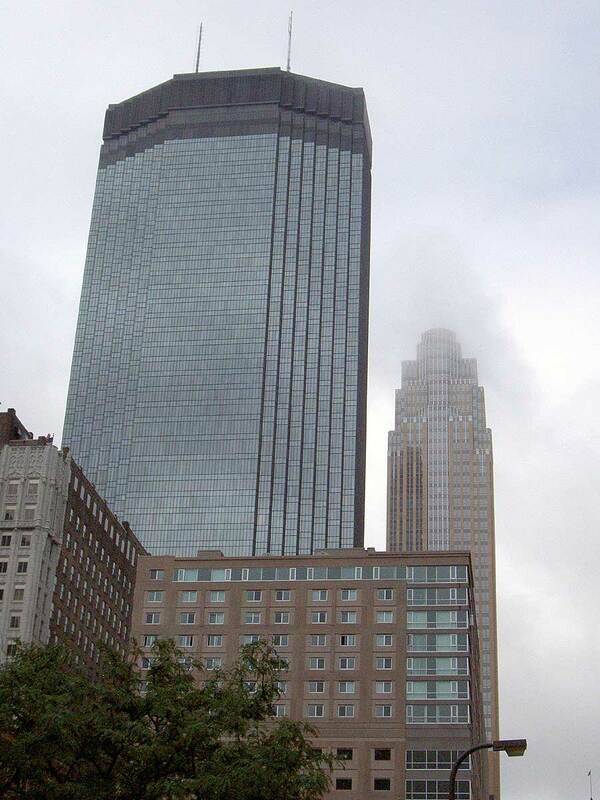 Here are some of the Minneapolis skyscrapers wreathed in clouds as the rain cleared. 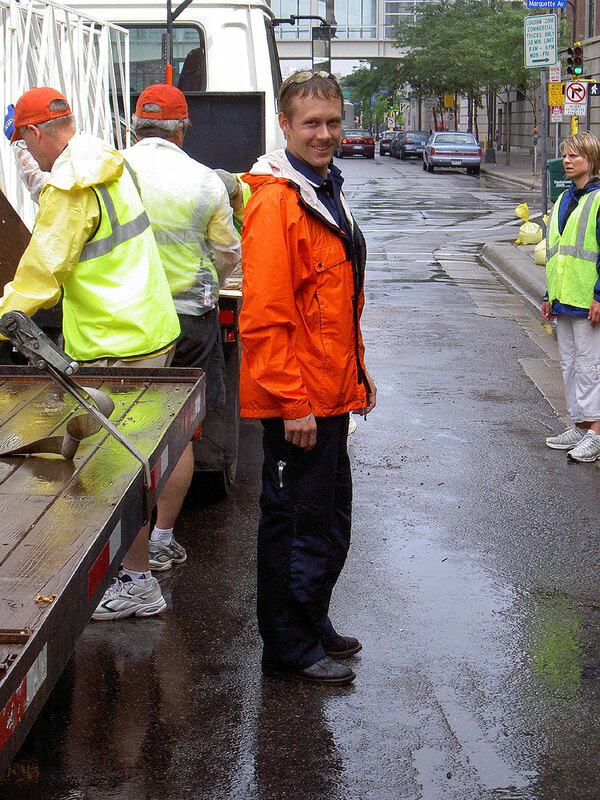 Some of the crew working in the rain. We're moving the fence truck to another part of the course. Andy's the coordinator for a couple of these races. A spot of rain's not going to slow him down! Andy may be in charge but that doesn't exempt him from helping! Here we're setting up in front of the Hell's Kitchen restaurant on 10th Street. You can see one of the loathsome sandbags on the right. Setting up fencing is a two-person operation--pick it up, install the feet as you walk into position, hold them in place until the fence is down. Emerging, one of the leaders asked if we'd do CAUTION taping. I don't know, I've never done it, I can think of no reason not to, it's not like it's stinkin' sandbags. Sure. He gives us 3,000 feet of CAUTION tape, says we need some sort of dispenser (you can buy nice ones for about $9 but we made do with a course marshall flag pole) and said to tape both sides of the street. Paul and I walked off full of swagger and confidence only to discover that we weren't sure exactly where the course went. Hmmm, we could sent them down the I-394 entrance ramp, never to be seen again! We walked back and found another volunteer coordinator and confirmed where the course was supposed to go, then spent a happy 45 minutes running CAUTION tape from light pole to parking meter to flower planter. It's no white fencing, but it was OK. I'd do it again. 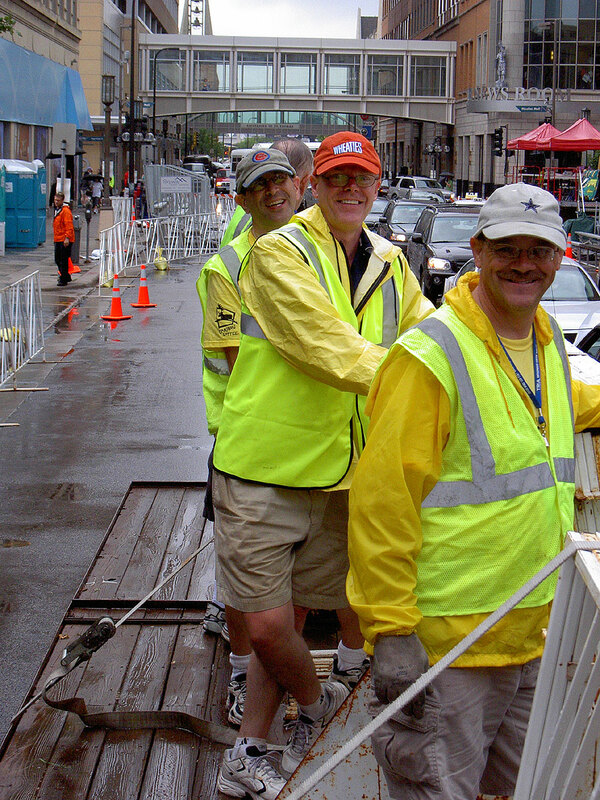 By the time we reported back the course marshalls had already been dispatched around the race course. We put on orange vests, collected flags and a whistle (I still had mine from Wednesday, although it turns out they run them all through a dishwasher each night) and walked back up the north side of the course with all the lovely CAUTION taping. At one intersection there were a couple of uncertain-looking marshalls, both newbies, it turned out, so Paul took one side and I the other and spent the races helping out. Crowds were nice again, once again I was on an inside corner, a couple of times we had to move people back a bit, but I also had the pleasure of lining up kids (stand right there and don't move!) so they could see the racers go zooming past. Races over, we went back, changed into yellow vests and went to work. I cut banners with my handy side-cutters for a while as a guy came along rolling up behind me, an ideal situation, then the fencing truck showed up and Paul and I spent the rest of the night pulling in fencing. Once that was in, and the finish line thing was down and apart, we unlocked the bikes from the Volunteer Tent, helped take it down, looked longingly at the lovely rare beef and large glasses of wine being eaten by the beautiful people in The Dakota (wanna trade for some peanut butter Nature Valley granola bars?) and rode off. We stopped by One on One for a short time, talking to Gene and drinking a beer and a half, the half being half a can each of Surly's Furious which I found annoyingly hoppy. I've made beer before, this stuff made me wonder if the guy tripped and dumped a whole bucket of hops in the brewpot instead of a cup and just said screw it, let's bottle it, maybe someone'll buy it. Paul figured Gene was happy to see us since that made him the third oldest guy there. We chatted with some of the kids back there who all seem really young, just out of college, first jobs, fixies, full of the joys of life, younger by a decade than Paul's saddle or my front hub. We rode on home and turned in. Saturday, no bike races. 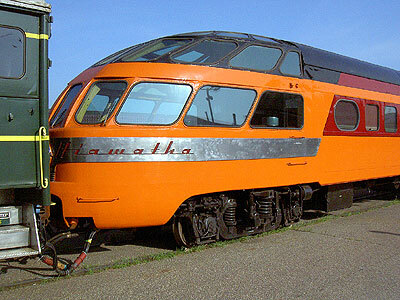 It's in Mankato and I've never gone down to see those. However, we did some planning. Paul's off to the Boundary Waters with the Boy Scout troop his son is in next week, and the forecast the next couple of days was hot and winds out of the south. 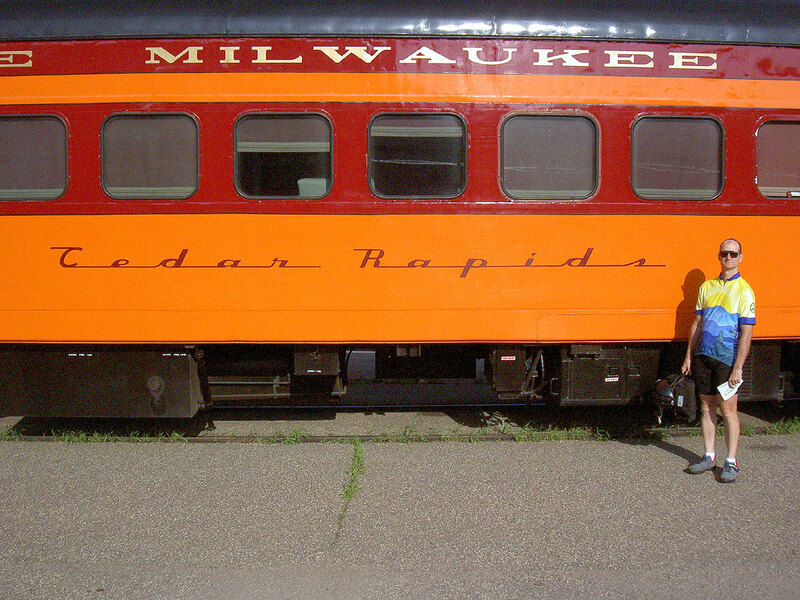 On Saturday I suggested he take the train to Winona or La Crosse and ride from there--the eastbound train is a 7:50AM departure (if it's on time). He decided this was a good idea, it pares 100 miles off the ride on a day that promised heat and headwinds. There was one issue: Amtrak wants you to box the bicycle. This seems silly, it's just Saint Paul to Winona, the next baggage stop down the line. Maybe he could talk them out of it. Paul shaved ("I do it once a week whether I need it or not") so he'd look respectable and we popped by the Amtrak station to see if he could just do a roll-on, roll-off, not disassemble and box the bike. Nope. You know, it's just the next stop, and I'll be riding it away. No, sorry. Bummer. 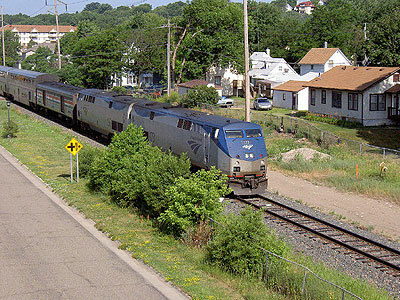 On some routes, Amtrak has a program (Bikes on Board) where you can do this, and it would be great from here east, where the luggage stops are Winona, La Crosse, Madison, Milwaukee and Chicago. But they don't offer it (yet--I think I'm going to write Amtrak and my Congressman and inquire about this). We went to find a bike box. My first thought was Erik's in Rosedale. I find Erik's a really boring bike store and I change radio stations when and Erik the Bike Man commercial comes on, but they are large and must sell tons of bikes, so they ought to have boxes. Nope. You have to reserve one. They get bikes in twice a week and immediately recycle the boxes unless you reserve one, so they have a modest collection off to one side but they're all for specific people. We hadn't reserved any of Erik's garbage, so next came County Cycles at Lexington and C2. I like these guys, and sure enough, they had a box Paul could have for free. Individual tire patches. He needed a couple. Individual allen wrenches. Need only a 3mm? You can get it here. a selection of tubular tires. Oh sure, they had bikes too, but it's the details that differentiate a cool bike shop from a boring one. Anyway, we went home and worked on packing the bike into the box. It was enough of a squeeze that I wonder what I'll do with my enormous Atlantis. Still, we got it in and taped it up. So Sunday we got to the train station about 6:45AM to check the bike in. We'd been warned to do it early because of all the extra handling. The train was running late, so we got a coffee and then I drove Paul around, showing him the Midtown Greenway both east and west of Hiawatha, the Short Line Bridge and the Hiawatha bridge a-building over the road and light rail tracks. Back to the station, where we poked around a bit. Security's a bit loose, and we looked at the train cars sitting around until some lady came out and yelled at us. Then the train showed up. 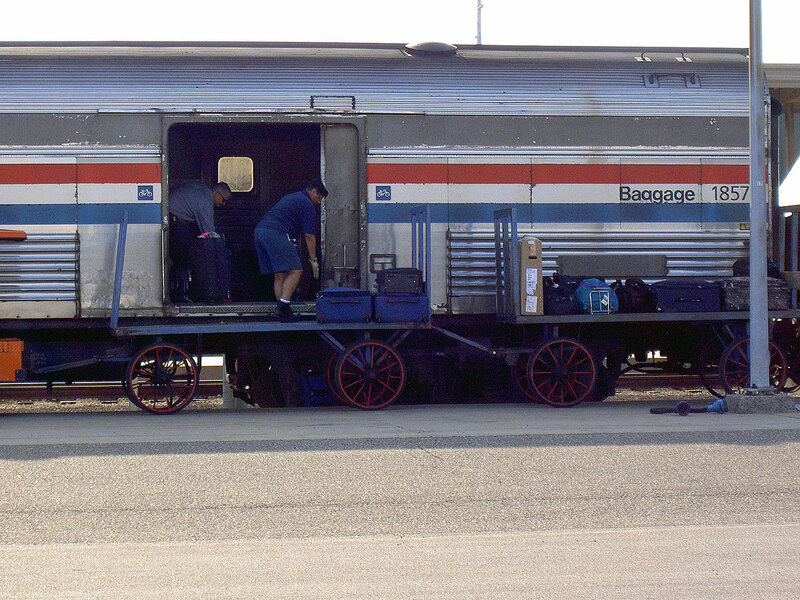 Paul got in line to board, I took a couple of photos of the luggage car getting loaded, and off I went home. 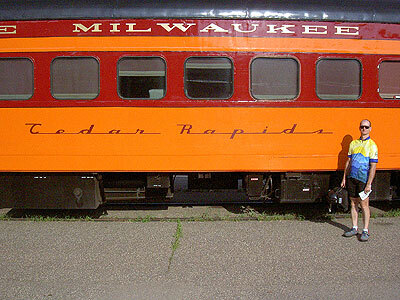 If you've read my Lake Pepin Three Speed Tour write-up, I mention at the very end seeing a cool custom railcar go by on the end of the Amtrak train. This is the car, I'm certain of it. It must be quite a view out of this car! Paul's from Cedar Rapids, and that's what the car is named. The logo would make a great headbadge! Paul's bike on the luggage cart on the right, waiting to get loaded. 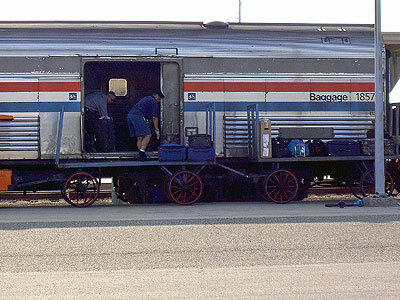 The annoying thing about this photo is that he had to box his bike but on either side of the door of the luggage car is a bicycle logo; this car is equipped with hooks for roll-on, roll-off Bikes on Board service! Grrrrrr! Tell me again why I have to box up the freakin' bike when you have bike logos all over your Baggage Car???? The train sets off to Winona and points east and south. In the Amtrak parking lot was a bike with this unusual display of what gear you're in. 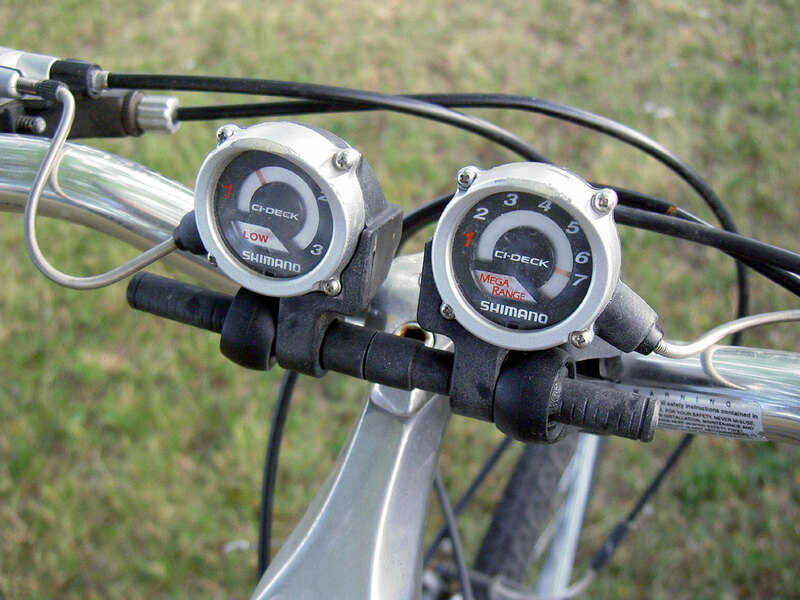 I suppose people in the bicycle business would know what this is and when it's from, but I've never seen it before. I changed into biking gear, got out the Atlantis and rode to Stillwater. This was 21 miles and I hadn't been out for several years. 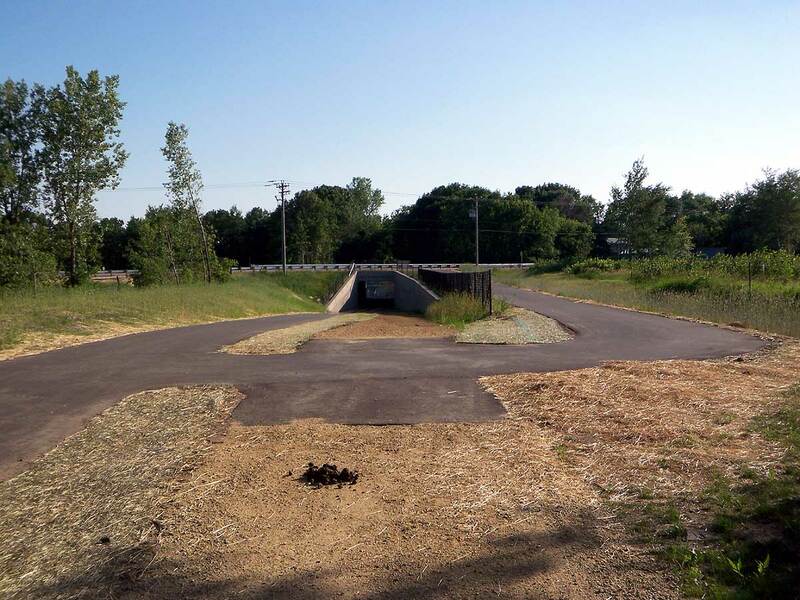 I liked the new underpass at County 12 and the Gateway Trail, much safer than the old level crossing. I was overtaken by many people along here including one large group that refreshed my memory on how much faster it is to ride in a crowd than it is solo, which I virtually always do. They caught me about half a mile from County 12 and for a brief time I was suddenly faster. I don't ever ride in groups, and I'm not sure of the etiquette; could I just ask to join them? I was uncharacteristically bashful, they moved onto the road at 12 while I took the bike path and I watched them ride away and disappear from view as I lumbered along solo. I might have to try some group rides. Once I'd plunged down the hill into Stillwater I was starved and ate one of the volunteer ham sandwiches. I pretty much lived on free sandwiches, Nature Valley granola bars, Sport Beans and Cokes during these volunteer stints. The women's race was already in progress and I was due to relieve a course-marshall at 1:30. My position was pointed out to me; it was right by the Expo where the racers would start, in full sunlight. The past couple of years I've been up on the brutal but shady Chilkoot Hill at the top of which lies the finish line. That's OK, I slathered myself in sunscreen, suited up with shirt, vest and whistle, and took over. Oh No! Look Out! This camera (a Kodak V705) does in-camera panoramas, but there's a bit of delay between each shot. The result is this three-shot, left-to-right image, what looks like a soon-to-be-fatal breakdown of course-marshalling as the unsuspecting pedestrians on the left are in dire peril of getting hit by the zooming racers on the right. The racers gathered at the start. The guys with the rope set the front row, which was widely ignored, and here are trying to gather up their rope while the men's field bakes at the start line. This guy's chain came off partway up the hill and he couldn't get it back on. He coasted back down and a mechanic works furiously on it. He got going again, but only after the peloton came by, leaving him a lap back. In a race where the judges began pulling racers two laps in, this probably wasn't good news for him. It was easy course-marshalling, the crowds mostly having gathered up on the hill. The racers all assembled right there in front of me and I could see them getting pulled, some as early as two laps into the race. It went on for an hour; 45 minutes at speed, then 5 laps declared and counted down. The field was winnowed severely, probably more than half pulled by the judges. With two laps to go there was a crash at the corner near me, one guy running wide into the fence, another crashing trying to miss him, another hitting him and flipping over the bars. There was nothing for me to do; other marshalls, a race judge and a cop ran over, a couple of marshalls waved their flags at oncoming racers who couldn't see the fallen riders, but in a couple of minutes it was all cleared out and the race carried on to its conclusion, cheering and excitement up the hill, some uncertainty about whether the racers would be back, and after a few minutes, everyone began milling about, cleared out briefly for a kids race. The same routine; switch vests, spend some time snipping down sponsor banners, then look for the fencing truck (of course, it was up the damn hill which is hard to walk up, never mind ride) and set off after it. 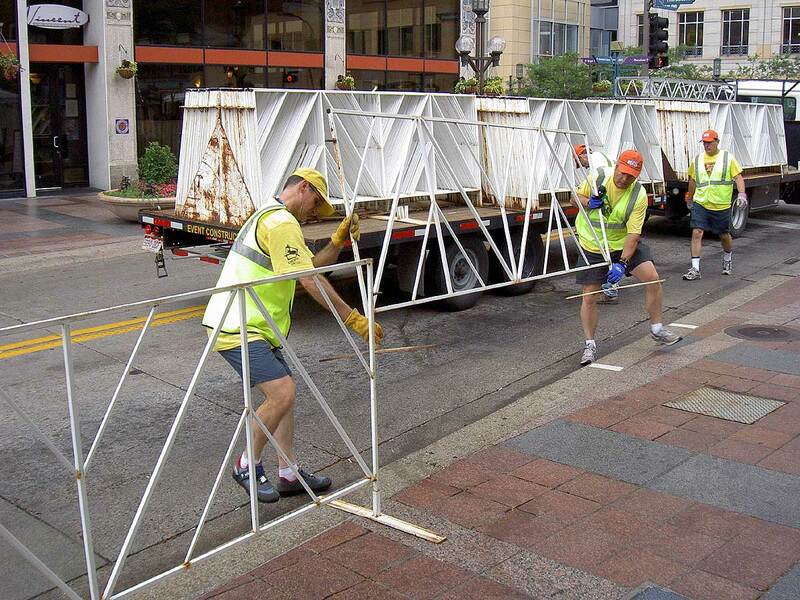 By the time I got there it had moved on and I helped disassemble the finish line scaffolding, then the truck showed back up with only two people aboard, woefully shorthanded, so I joined them and spent the rest of my time taking in fencing. Man, this was hot. I eventually went and sucked down a couple of ice waters, then rejoined the teardown efforts. About 5:00, the fencing in, me wilting in the sunlight and heat, I turned in my vest, drank some water, mounted up and rode off. I thought about a beer and snack along the river, but wasn't really that hungry yet, so set off up the hill out of town. Since I was last out this way, the Gateway Trail got an underpass under County 12, much safer than a level crossing. It's shared with a horse trail, as you might see. This hill isn't as steep as the one on the race course, but it was all I could do to slog up the bloody thing. I found myself getting hungry for something other than Sport Beans and granola bars and came across a farm selling strawberries. I bought a pint and sat in the shade at a picnic table and ate the lot. Ahhhh, much better! I rode on home, County 12 to the Gateway Trail, that to Arlington, then surface streets home, not riding very quickly, and arrived right at 7:30, tired, grubby and hot, to take a lovely shower and change. Another race set over. It's a lot of hard work even as a lowly volunteer, but it's also a pretty satisfying time. I don't regularly do much in the way of physical labour and there's a refreshing simplicity to dealing with fencing and CAUTION tape and sponsor banners and even to course-marshalling with it's opportunities for public interaction. The races are good fun to watch, and they're satistying to work. You might consider doing one or both next year. 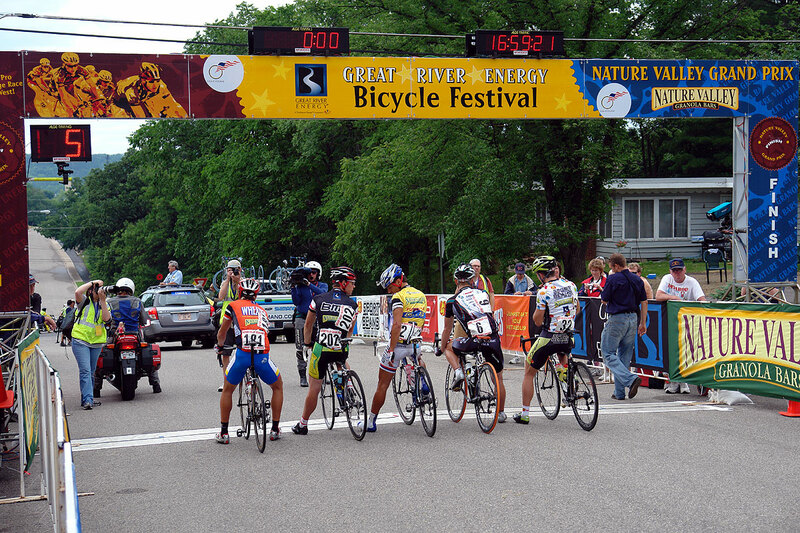 The Great River Energy Bicycle Festival/Nature Valley Grand Prix bike races are coming up. This is a series of five races running Wednesday June 20th through Sunday June 24th. I volunteered as a crossing guard and for setup and teardown in the past, including last year's Minneapolis Criterium, cut short by thunderstorms with teardown in belting cold rain. My buddy Paul rode up last year and is doing so again this year. 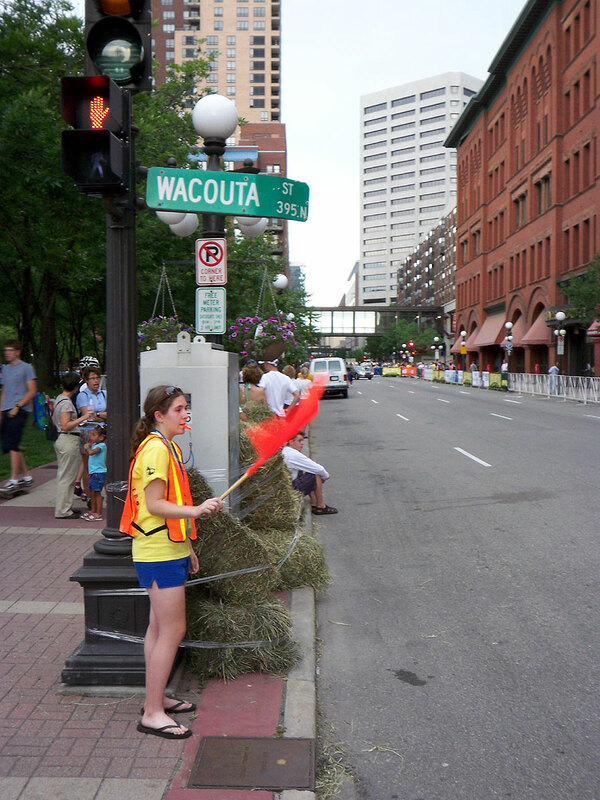 We're volunteering at the Wednesday Criterium (changed from the Time Trials they've done on Wednesdays in the past) in Saint Paul, Friday afternoon's Time Trial in Saint Paul (along Lilydale Road this time) and Friday evening's Criterium in Minneapolis (will it rain again? good chance!). 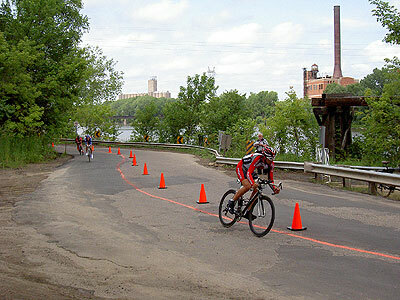 Paul's heading back Sunday, but I'll be at the Sunday afternoon Criterium in Stillwater with its brutal hill climbs. I think they still need volunteers, so if you have an interest, go to the site's Volunteer Page and sign up. Setup and teardown are pretty easy and being a crossing guard is straightforward. I personally take along foam earplugs (stacking the metal fencing in teardown Friday evening can leave your ears ringing), leather gloves and a pair of diagonal cutters, useful for snipping the sponsor banners' Zip-ties off the fencing. Sunscreen is good, raingear has been essential. On the off-days, we're just going to hang out. We'll probably go down to Cannon Falls to watch (and not work on) the road race. The race loop is such that you can catch several bits of the race by moving around a little. Volunteering isn't too hard, you get a good view of the race and, if you see Paul and I around, you can join us for a beer afterwards.